When my daughter saw this card she described it as 'atticky' by which I'm very much hoping she meant 'vintage' rather than some old thing that's been buried under a pile of musty newspapers for ten years! It's quite a masculine card too - and they are always handy. 1. Cut a piece of SU Night of Navy card stock 4 1/2" x 3 1/4". Stamp the top righthand corner with the leaf image from the (sadly retired) SU set Carte Postale and emboss with clear embossing powder. 2. Cut a piece of music paper 4 1/4" x 3" (mine is just a colour photocopy of old sheet music). 3. 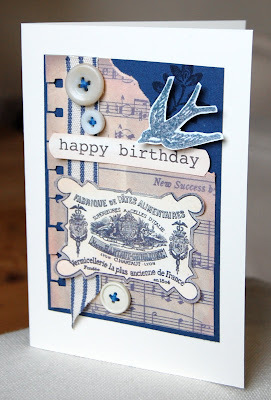 Make a decorative border on the left of the music paper with a spiral punch. 4. Tear off the top right hand corner, distress the edge and adhere to the navy card stock. 5. Fix a piece of vintage style ribbon to the right of the spiral punched border. My ribbon is from East of India - so gorgeous it makes me want to faint! 6. Stamp or print a sentiment using Chocolate Chip ink on Very Vanilla Card stock, cut out, round the corners and sponge the edges with Blush Blossom ink for that vintage look. 7. Stamp or print a vintage image (mine is from a fabulous site called The Graphics Fairy - check it out), cut out and sponge the edges again. Adhere the sentiment and image onto the music paper overlapping the ribbon. 8. Adhere the whole thing to a piece of A5 Very Vanilla, folded to make a card base. 9. Stamp the bird from Carte Postale in Bordering Blue ink and emboss with clear embossing powder. Cut out and pop him up in the right hand corner with dimensionals. 10. Embellish card with cream buttons. I'm normally a clean and simple kind of a girl but I'm rather drawn to this vintage look. Look out for more 'atticky' cards on this blog! WoW, I love this too! Between the bird, the color combination, and the vintage-style, it's a winner! !